JEFFREY: I think we should discuss this first. LINDY: Are you going to sack her or not? JEFFREY: Just come into my office for a moment, will you? LINDY: I want an answer *now*, yes or no. JEFFREY: Come into my office, and I'll give you your answer. Annalise looks very worried as the couple depart, but then she goes over to confront her enemy, looking down upon a seemingly innocent Shannen sitting at her desk. ANNALISE: You couldn't wait, could you? SHANNEN: What do you mean? ANNALISE: To tell Miss Society Princess about me and Jeffrey! SHANNEN: I didn't know it was a secret. ANNALISE: (angrily) Oh, you were trying to get rid of me from Day One. SHANNEN: Nonsense! How was I to know she'd react like that? ANNALISE: (sneering) Oh you knew alright. Shannen stops talking to look past Annalise. SHANNEN: I wonder what's going on in there? Annalise glances back at Jeffrey's office. SHANNEN: Guess we'll have to wait and see - won't we? Annalise ruefully shakes her head at Shannen's villainy. Debbie is threatening to tell Cathy about Rick running the coffee shop. He promises to get Debbie her money; he just needs a little more time. Mark overhears and asks Rick if he's having problems. RICK: She found out her wages were half what I paid Kristy. Now she's threatening to dob me in to Mum. Now what kind of a friend is that? MARK: She could say the same about you! Rick says it's called business. Shannen tells Annalise she has a feeling that once Ms Chatsworth has had her say, Annalise won't have a job. Jeffrey and Lindy come out of Jeffrey's office, arguing. 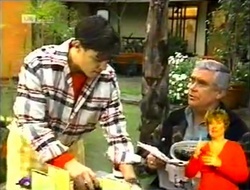 Lindy has a go at Annalise for staring but Jeffrey sends her away and then calls Shannen into his office. Philip grabs Julie but she has the flu and isn't in the mood. JULIE: I want to go to bed. PHILIP: Good idea. Come on… let's go. Hannah comes in wet from playing in the rain and starts sneezing. Julie says that's all she needs. Lou is reading the paper and says Stephen and Phoebe's record bar is opening this weekend. Rick isn't happy about Debbie blackmailing him since he took Lou's advice and sacked her. Lou tells him not to give in or Debbie will have him over a barrel, and Cathy will find out eventually anyway. Rick hopes he can hang on until his bank balance is back to what it was so that Cathy will double it. Debbie appears and Rick tells her he still needs more time. Debbie gives him until 7pm. Shannen comes out of Jeffrey's office. She has been sacked and has a go at Annalise. ANNALISE: I am sorry to hear that, Shannen. SHANNE: Sorry? I bet you are. Just because he prefers your body to my hard work. Jeffrey tells Shannen it's because of remarks like that and tells her to leave straight away. He takes Annalise into his office and tells her he only ever had a casual relationship with Lindy. He likes Annalise and wants their relationship to be more than a business one. However she's going to have to choose between him and the job. Hannah has worsened and Julie gives her some soup to warm her up which Hannah is less than impressed with. Philip comes in and is all over Julie again. She tells him to go away because she's got cleaning to do. Debbie comes in looking for her jeans and isn't happy that Julie hasn't mended them. Julie tells her she shouldn't be going out tonight because school starts tomorrow but Debbie is still adamant she's not going back. Annalise tells Lou she doesn't know what to do. What if she gives the job up for him and then they break up in a couple of months? This job is such an opportunity for her. Lou thinks she should go for it as he's never heard her talk like this before, and if the two of them are working together every day the spark will burst into flame one way or another. Debbie arrives and Rick asks her to help as he's busy but Debbie simply reminds him of the 7- o- clock deadline. Mark offers to take over so Rick can go to the bank but Rick is refusing to give in to Debbie's demands. Annalise arrives and asks Mark if he's doing anything tonight as she needs to talk. 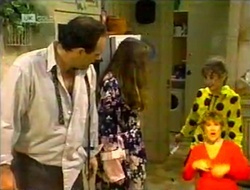 Philip tells Julie to go to bed and he and Hannah will make dinner, although Hannah wants to go to bed too. Philip keeps asking questions and Julie decides it would be easier to do it herself. JULIE: Being looked after by this family is worse than being ill! 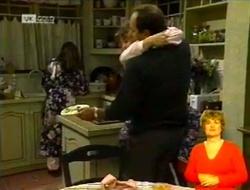 Debbie overhears Mark on the phone telling Gaby he can't make it tonight. Debbie asks him if he's two- timing her and Mark says it's not like that; Annalise just needs a friend. Debbie tells Rick his time is up; she's going home to call his mum. Annalise tells Mark about Jeffrey's ultimatum. Mark says it's sexual harassment and she should quit. Annalise says he's just trying to do the right thing. ANNALISE: Argh. Go on, say it. What does he want with a dumb chick like me who never finished high school? Lou arrives and finds Rick closing up early as he needs to go and get Debbie's money, although it could be too late already. Hannah is too sick to eat. Debbie can't get through to Cathy. Philip tells her to get off the phone and Julie tells her if she wants privileges she has to earn them. Debbie says if she means her going back to school she can forget it. She's going to get ready to go out. Julie tells Philip to do something but Philip tells her the more she picks on Debbie the less likely she is to co- operate. Hannah goes to throw up. Annalise phones Jeffrey to tell him she wants to keep her job. Jeffrey is surprised. He tells Annalise their relationship will be purely professional and abruptly says goodbye. Philip is cuddling Hannah so Julie has to go and answer the door. It's Rick with Debbie's money. Philip tries to carry Hannah to bed and drops a plate in the process. He asks Julie if she really wants another child. Rick arrives home and Lou tells him Cathy is on the phone. RICK: Mum? No, no… I'm not here! I was never here! I don't exist!